Oracle Purchasing is the application for procurement professionals that streamlines purchase order processing while strengthening policy compliance. It is a key component of Oracle Advanced Procurement, the integrated suite that dramatically cuts supply management costs. The Professional Buyer’s Work Center leverages Multi-Org Access Control (MOAC) by allowing buyers to view and manage documents across all of the operating units they service. For more details, please reference the MOAC section of this document. addition, buyers can return requisitions to requesters to solicit additional information, reassign requisitions to other buyers, split requisition lines in order to source from multiple suppliers and replace off-catalog requests with items available in the catalog. 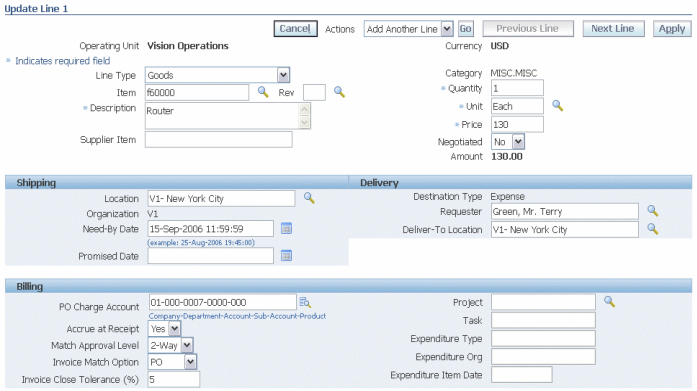 The Work Center user interface optimizes the standard purchase order creation and management processes. The new user interface allows buyers to edit and view delivery schedules and account distributions across all order lines, thus eliminating the need to drilldown on individual lines. For simple purchase orders that do not require staged delivery schedules or multiple account distributions, buyers can quickly enter all necessary information for the orders in the header and line sections, without having to navigate to the schedules and distributions sections. The Professional Buyer’s Work Center provides a dedicated user interface for creating and maintaining agreements, targeting the strategic buyer responsible for agreement maintenance and compliance. Release 12.0 of Oracle Purchasing builds on the popularity of Oracle iProcurement’s search capabilities by offering professional buyers a similar search interface to easily find the items they need to procure. From the Demand Workbench, buyers can access the catalog to find negotiated alternatives to non-catalog requests. While authoring orders and agreements, buyers can use the catalog to quickly add items, thereby accelerating the document creation process. Release 12.0 introduces a new HTML UI for managing suppliers, which replaces the existing Suppliers Form. The new UI delivers an improved layout for accessing all aspects of a supplier's setup, providing a clear distinction between the supplier's company details and the terms & controls that are used to manage the trading relationship. General and site level setup parameters is now available on a single page and work has been done to rationalize the organization of setup preferences across fewer sub-tabs to allow administrators quicker access to information. In addition, a new Quick Update page gives each administrator access to an initial summary page that can be personalized to suit the needs of their role. 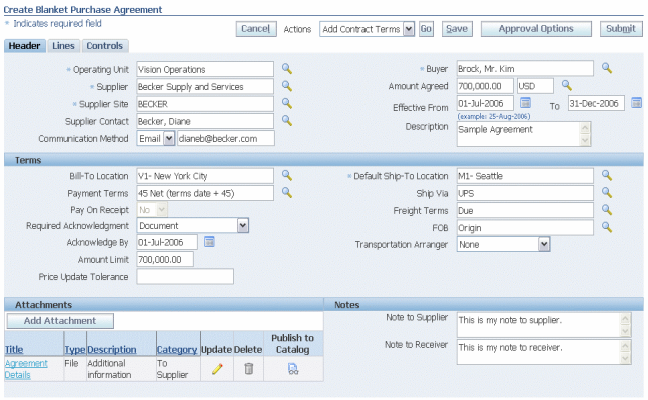 For those companies that have enabled supplier access to their profile information through the Portal, the Supplier Profile Management tools have been integrated into the Setup UI pages, affording administrators a single view of a supplier's setup and any pending updates that have been provided by the supplier to the buying organization. The new Supplier UI also includes a Survey section that provides administrators with access to the results of questionnaires that were created using i Survey and which the supplier had been asked to complete, either during self-registration or as part of profile maintenance through the Portal. Security controls are incorporated into the Setup UI so that companies can limit an administrator’s access to specific tabs within the supplier setup. This feature is key for assisting companies to comply with the separation of duties elements of the Sarbanes-Oxley legislation. Document styles allow buying organizations to control the look and feel of the application to match the needs of different purchasing documents. Through reusable document styles, deploying organizations turn on or off various Oracle Purchasing features, thereby simplifying the user interface. When a purchasing document is created using a document style, disabled features are hidden to simplify the user interface. For example, organizations can create a document style for a specific commodity, such as temporary labor. This document style optimizes field labels and presentment for that commodity, simplifying purchase order entry by hiding regions/attributes that are only relevant for that commodity. In addition, document styles provide the ability to appropriately name purchasing documents to align more closely with the naming conventions of the deploying organization’s business. In other words, the same purchasing document type (e.g. Standard Purchase Order) can assume different names based on the style applied. The following figure shows a style intended for authoring agreements and orders to acquire facilities related services. The name assigned to Standard Purchase Orders using this style is ‘Facilities Maintenance Order’. The name assigned to Blanket Purchase Agreements using this style is ‘Facilities Maintenance Contract’. These names are exposed throughout the Work Center and also to the supplier. Release 12.0 will support acquisition of complex services by allowing buyers to author, negotiate, execute and monitor complex contract payment arrangements like progress payments, advances and retainage. Please see the Services Procurement part of this RCD for more details. Multi-Org Access Control enables companies that have implemented a Shared Services operating model to efficiently process business transactions by allowing them to access, process, and report on data for an unlimited number of operating units within a single applications responsibility. This increases the productivity of Shared Service Centers for users who no longer have to switch application responsibilities when processing transactions for multiple operating units at a time. Data security is still maintained using security profiles that are defined for a list of operating units and determine the data access privileges for a user. In Release 12.0, Oracle Purchasing will leverage the new Multi-Org Access Control capabilities to support more streamlined operation of Shared Procurement Service Centers. Without changing Responsibility, and without closing windows, buyers will now be able to view consolidated requisition demand spanning multiple operating units. Using a single Responsibility, they will be able to manage demand (i.e. requisitions), conduct sourcing events, enter into agreements and issue purchase orders on behalf of any of the operating units that they serve. The operating units that they can transact on behalf of will be controlled by the security profile associated with their responsibilities. Similarly, receiving clerks will now be able to easily inquire about, plan for and receive expected shipments against purchase orders or requisitions or RMAs originating in multiple operating units without needing to close windows and change responsibilities. Oracle E-Business Tax is a new infrastructure for tax knowledge management and delivery, using a global system architecture that is configurable and scalable for adding country specific tax content. As the single point solution for managing transaction-based tax, Oracle E-Business Tax will deliver tax services uniformly to Oracle E-Business Suite business flows through one application interface. 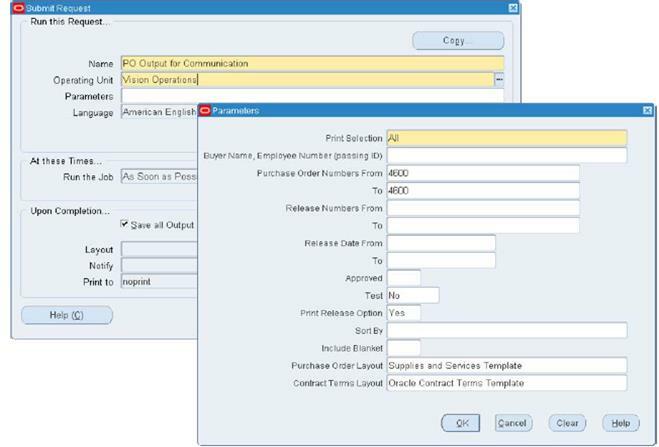 Oracle E-Business Tax significantly enhances the current tax code/tax group based tax computation capabilities within the Procure to Pay business flow. For more information, please refer to the Oracle E-Business Tax section within the Oracle Financials RCD. Release 12.0 further enhances the 11i10 feature, which introduced the ability to generate purchasing documents in Adobe PDF format. In Release 11i10, generation of purchasing documents in Adobe PDF format required organizations to create layout templates in the form of XSL-FO style sheets. With Release 12.0, organizations can also use RTF or PDF layout templates which require little training to configure and maintain. In order to comply with reporting requirements of regulatory bodies, organizations, especially in the public sector, need the ability to publish the contracts that they award in multiple formats as prescribed by these bodies. In Release 11i.10, Oracle Purchasing supported generating purchasing documents in Adobe PDF. Format for such documents were limited to a single layout template as configured in the Document Types Setup. Release12.0 enables buying organizations to easily publish documents on demand using any predefined layout template. To generate a document using a certain layout, organizations simply provide the layout name as a runtime parameter while submitting the ‘PO Output for Communication’ concurrent program. One particular application of this feature is for public sector organizations to generate government forms (such as SF30, OF347 etc.). Release 12.0 enables buyers to communicate all necessary document attachments to suppliers. Oracle Purchasing supports various types of file attachments (MS Word, Excel, PDF etc.) that can be appended to purchasing documents in addition to long and short text attachments. In previous releases, only text attachments were communicated to suppliers. With Release 12.0, buyers can communicate all necessary attachments to suppliers, including file attachments via email. When the system emails a purchase order to the supplier, the corresponding file attachments appear in a zip file attached to the email. System administrators can specify the maximum allowable size for this zip file to minimize network traffic. Oracle Supplier Network lets Oracle Purchasing customers leverage pre-defined connectivity to quickly enable electronic messaging with suppliers. 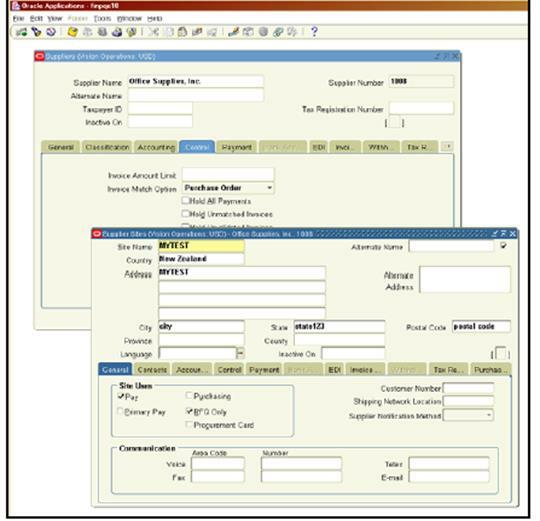 The Oracle Supplier Network (OSN) provides a community of suppliers available for transaction integration, capable of sending and receiving XML documents, such as Purchase Orders and Invoices. The hosted network service eliminates the costly IT effort involved in building and maintaining direct connections with specific suppliers since each trading party only has to maintain a single connection with the OSN. This enables companies to drive machine-to-machine messaging down to a larger base of their repetitive suppliers with even less resources. Release 12.0 is certified with the OSN, which ensures that all R12.0 Purchasing and Payables’ XML documents are fully supported for end-to-end message routing and transformation over the OSN. A quick start guide is provided to help buying organizations quickly connect R12.0 to the OSN. Release 12.0 streamlines enabling blanket agreements for automatic document sourcing in specific inventory organizations. Previous releases allowed buyers to instruct the system to automatically create sourcing rules, sourcing rule assignments and approved supplier list entries out of all blanket agreement lines during blanket agreement approval submission. The system would then automatically source of requisition demand for all inventory organizations within an operating unit Release 12.0 allows finer control of how blanket agreements are enabled for automatic document sourcing. Buyers can now choose to enable them only in specific inventory organizations. Thus, buyers can negotiate a blanket agreement to fulfill requisition demand for a subset of inventory organizations and enable the agreement for auto sourcing only in those inventory organizations. To use a blanket agreement for autosourcing in a specific inventory org, the buyer simply submits a concurrent program specifying the inventory organization and the blanket agreement number as runtime parameters. More and more companies are outsourcing part or all of their procurement processes in an effort to reduce costs and improve efficiencies. In keeping with this recent trend, Oracle Purchasing Release 12.0 introduces support for contingent workers in the procurement process. Authorized contingent Purchasing workers can raise requisitions, conduct negotiations, and create and maintain purchase orders. Release 12.0 makes inventory replenishment more efficient and less expensive by applying supplier-packaging constraints to replenishment choices. Material replenishment recommendations from Inventory Planning systems are typically designed to maintain inventory levels to match predetermined policy guidelines. Such guidelines seldom take into consideration packaging lot sizes or minimum order quantity requirements of the supplier. Placing orders based on such requests without any review or adjustment may force the supplier to over or under-ship the order, or even reject the order. 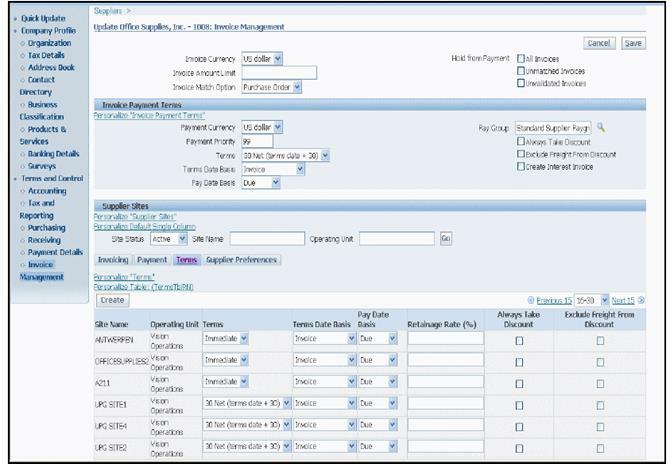 To reduce cost and time delays associated with administering such orders, Oracle Purchasing can automatically apply supplier-specific order modifiers, including fixed lot multiple and minimum order quantities to replenishment requests that originate in Inventory planning systems. These include Min-Max, Reorder Point and any requisitions imported from legacy systems via the open interface. Automatic application of such modifiers can be used both for requisitions sourced from external suppliers as well as those sourced from internal warehouse locations within the enterprise. With Release 12.0, business users can use a web-based interface to define tolerances for auto-approval of document revisions. Release 12.0 extends the support for Enterprise Asset Manager (eAM) to include fixed price services line types. Now requesters can associate maintenance Work Orders and Operation References for fixed price services requisition lines. The existing eAM integration for goods and amount based requisition lines is still supported. With Release 12.0, Oracle Purchasing extends the integration with Oracle Advanced Pricing to allow procurement professionals to model complex pricing rules for items listed on Global Blanket Agreements. Requisitions and orders sourced to these agreements can now leverage dynamic pricing formulas and/or modifiers defined in Oracle Advanced Pricing, in addition to the agreement line price and price breaks. Position based hierarchies allow organizations the flexibility to create reporting structures that remain stable regardless of personnel changes. Enterprises already using position hierarchies via Oracle Approval Management can immediately leverage those hierarchies for the requisition approvals process. The Parallel Approvals functionality gives enterprises the option to speed up the approvals process by routing a requisition to multiple approvers simultaneously. Certain individuals or business roles need to be kept informed of purchases and decisions, but do not necessarily need to take action against that notification. Release 12.0 provides new functionality to allow certain individuals or roles to review the purchases, but do not require any response from the recipient. In Release 12.0, Oracle Purchasing utilizes the new Subledger Architecture (SLA) for encumbrance accounting entries created for documents in Oracle Purchasing and Oracle iProcurement. These entries will be available for analysis and reporting with other SLA reports. Customers will also now be able to configure accounting annotations for their purchasing encumbrance accounting entries. Please see Subledger Accounting section of the Release 12.0 Oracle Financials RCD for more details. The new UIs will also leverage MOAC, making it easier for system administrators to perform setups in multiple operating units in the context of a single application responsibility. The Japanese legal and business practice of Chargeable Subcontracting is a method of subcontracting assemblies from an OEM to one or more manufacturing partners. According to this method, the OEM ships and makes a provisional sale of component materials used to build the assembly at the manufacturing partner. When the assemblies are completed and returned to the OEM, the manufacturing partner bills the OEM for the gross price of the assembly. In order to provide support for the Chargeable Subcontracting business practices, the Pay on Receipt Auto-invoice program has been enhanced to create separate invoices for these items. For more information, please refer to the Chargeable Subcontracting features within the Oracle Logistics RCD. In many industries, such as the meat, poultry, metals or chemicals industries, ‘catch weight’ is a term used to track inventory simultaneously in two different units of measure. To run their businesses, these industries need to know the number of cases, bars or drums of product stored, as well as the weight or potency of that product. Prices are calculated based on the shipment weight of the product, not on the number of cases or units shipped. Oracle Inventory's Dual Unit of Measure Control enables users to transact inventory in two unrelated units of measure where the conversion between the measures vary from lot to lot or from one transaction to the next. The dual unit of measure support that had been available only for Oracle Process Manufacturing enabled organizations is now available for all Inventory organizations. Thus, if a user chooses to enable dual unit of measure control for a given inventory item, Oracle Receiving will now require quantity entry in two units of measure according to the defaulting rules set up at the item level. Quality Control and product lifecycle issues may require that certain material, although stored in a ready to use state in the warehouse or production facility, may not be usable for certain applications. A lot that has not yet passed inspection should not be shipped to a customer or consumed in production. A warehouse location that has been discovered to have erroneous inventory balances should not be included in available to promise calculations. 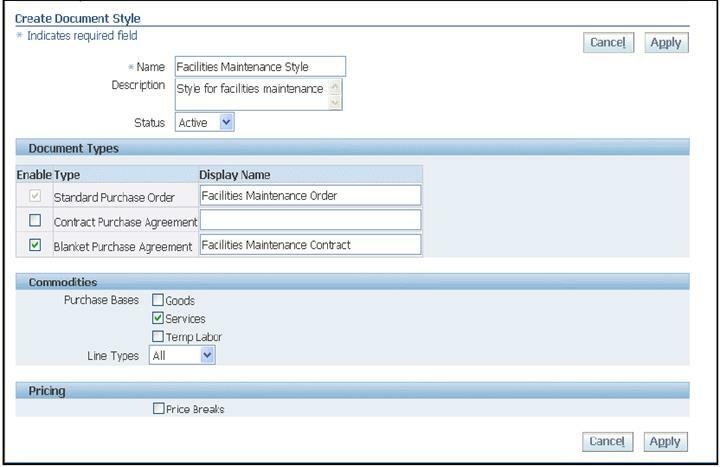 With this release, if material status control has been enabled for a given lot or serial controlled item, Oracle Receiving will now require quantity entry of the status for each new lot or serial received. Which lots were delivered to which customers? Which other lots were produced from that production line during that shift? What was the quality of the components or ingredients and which suppliers sent them? To enable better visibility to a lot and its genealogy and attributes, significant enhancements have been made to the lot tracking capabilities within Oracle Inventory. Sublot control allows users to track the parent lot from which multiple lots were created. The parent lot may refer to the production batch that spawned the lot, but if the output of that batch varied in term of grade or other QC attributes, multiple sublots could be received into inventory. Users can query lots in by their parent lot and view the parent lot in the lot genealogy form. Users can also now grade control their lot controlled items. With this release, if sublot control has been enabled for a given item, Oracle Receiving will now require quantity entry of the parent lot for each new lot received. For more information, please refer to the OPM Convergence features within the Oracle Logistics RCD.